Health and Wellness has been my priority lately ever since I got into jogging again. I've realized the importance of maintaining a great lifestyle after all the strenuous activity I've been to. That's why when I found out that there will be a health and wellness event like Nestle Wellness Expo, I never missed the chance to go to this unique one of a kind event. Last July 14, 2013, I went to the Nestle Wellness Expo at the Megatrade Halls 1-3, SM Megamall. This event is already on its 4th year and it’s been anticipated by families living mostly around the Metro. Upon registration, they will give you a bracelet tag which you’ll be presenting on every booth that you are about to visit. If there is one thing that I love in this Expo, it would definitely be the technology that they had used in the event. The bracelet tags given to every participant serves as their time inside the venue. Also, you can check how many booths have you visited already just by tapping your tag to the tablet held by the Nestle Wellness Expo staff on every booth. After the registration, the ushers will lead you to a room discussing the Expo’s rules and regulations. It was discussed on the rules and regulations that every participant should stay inside the premises for maximum of two hours. If you get to visit at least three Wellness booths and have your own nutritional consultation taken at the same time, you get to take home a token from Nestle--a Nestle Umbrella! Even the Nestle Wellness has their own booths for everyone! Of all the booths that I’ve been to, I’d like the Nescafe booth best. 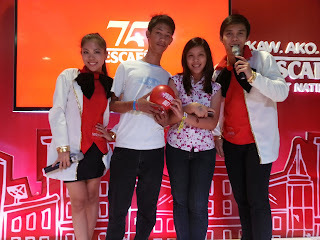 They’re already celebrating their 75th year and I should commend how they set up their booth. On the leftmost part of the booth are the different products of the Nescafe brand. Woot! I tried their latest product-the Frappe. I also participated on one of their games. You’re just going to pass the balloon to the one on your right. Once the music stops, you’re out. Yaay! I won a canister filled with the different Nescafe products. Here is the Nutritional Consultation Booth wherein Nutritionist-Dietitians are present to analyze what lifestyle do you have now and how would you make it better. They would also recommend you certain products that would help you maintain a better and suitable lifestyle. In the end, I met the requirements needed and had my own Nestle Wellness Expo Umbrella (apart from all the freebies that I received from the booth)! Go to http://ww1.nestle.com.ph/wellness/ for more info!